Microsoft (Bing) have launched a cool new app on Windows Phone. It is called “We’re in” at it is an app that helps you see where your friends are and organize get togethers. It works by just making an account which it requires just a picture of you and your phone number. No one can see your location if you aren’t set up as their friend – same goes the other way around obviously. I really like the way that Microsoft supports their own platform by putting out these apps for free. Weâ€™re In is an application that simplifies the logistics of meeting your friends. Weâ€™re In makes organizing get-togethers, carpooling or trying to find people in a crowd a breeze. Any time you want to see where your friends are – We’re In can help you. It’s simple, invite your friends, and when they join, they’ll see your location and you’ll see theirs. 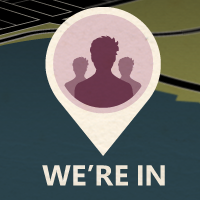 When the invite expires, so does the shared location – no complicated process to worry about. Written by: Hyde13 on August 18, 2011.
that works too. If you have attempted to use the Zune client to download an app to a Windows Phone, you’ll understand why it’s MUCH more preferable to download apps on the phone directly – hence some sort of wp7-visually-consumable tag that folks can easily snap from the web page.